Fuji Five Lakes or Fujigoko area consists of stunning natural settings, hot spring resorts, traditional old style buildings, museums, and picture-perfect walking trails along the banks of the lakes to walk through. Spring and autumn are considered to be the best time to roam around the area. Although springtime here is much more breathtaking than autumn, yet I have found some of the attractions to love here that take you away from the hustle and bustle of everyday life. Taking this into account, you might be interested in exploring it in the fall to see its incredible fall colors and the iconic Mount Fuji in the background. Lake Kawaguchi, Mount Fuji and Autumn Leaves. Photo Credit: Wikimedia Commons. Seated in the northern base of Mount Fuji, this stunning touristic zone offers year-round recreation for travelers of all ages. Fuji Five Lakes (Kawaguchiko, Yamanakako, Saiko, Motosuko, and Shojiko) area does not only showcase mind-boggling views of Mt. Fuji and impressive scenery of the four seasons, but also historic landmarks like Kubota Museum, Iyashi no Sato, and Chureito Pagoda. For the ultimate guide to planning your Fuji Five Lakes vacation in the fall, you should take a look at the following outstanding fall foliage spots that will help you plan the perfect Fujigoko gateway. Beautiful display of fall foliage at Iyashi no Sato. Photo Credit: www.fujisan.ne.jp. Before you embark on a leaf-peeing trip to Fujigoko, the most important thing you should always be concerned with is the fall foliage forecast of the area. There, leaves of the deciduous trees start changing colors around late October, while the peak time is in mid November, and in some areas autumn leaves can enjoyed till early December. The maple trees you see in the shore of Lake Yamanakako reach their peak around the second week of November. While on the other hand, if you want to catch the stunning fall foliage displays in the northern shore of Lake Kawaguchiko, then pay a visit to the area in mid November. Maple trees have been illuminated gorgeously. Photo Credit: Fujikawaguchiko Tourist Information. The Fuji-Kawaguchiko momiji matsuri is an autumn festival held at maple corridor on the northern shore of Lake Kawaguchiko. This year the festival will be celebrated from November 01 to November 23, 2018. If viewing Mt. Fuji is one of your dreams, and you want to make it a reality, then don’t you forget to take a walk along the north shore of Lake Kawaguchiko. That will be an absolute bliss! This is arguably one of the must-see autumn festivals in Japan where visitors are offered to enjoy the incredible views of the fall colors by talking a stroll along the maple corridor and koyo tunnel. Craft shops and foods stalls can be seen at the venue. From there you can find some cute souvenirs to bring home and taste the local specialties from the food vendors. A walk in the Koyo Tunnel (rows of maple trees that line the road) takes you on an unforgettable expedition. The more you walk in the tunnel, the more impressive scenery you will experience. Here, you can expect to see gorgeous fall colors along with a view of Mt. Fuji and Lake Kawaguchiko. This sight is missing at the maple corridor though. The maple corridor. Photo Credit: www.fujisan.ne.jp. When you are in this area, make sure you head over to Itchiku Kubota Art Museum. The garden of the museum is very attractive as hundreds of deciduous trees there come alive with vividly colored leaves in mid November. If you don’t have enough time to get inside the main building of the museum, just take a leisurely walk into the garden and you will be blessed by Mother Nature. Continue your journey to the main spot of the festival, the Maple Corridor. During the peak leaf season, many visitors visit the area; they walk down side of the corridor, and enjoy its surrounding nature beauty with not missing the view of the maple trees that are it up gorgeously after the sunset. The illuminations in the evening are quite impressive and I bet you will be overwhelmed by the lively atmosphere it creates. Chureito Pagoda during the fall. Photo Credit: www.japan-guide.com. I can recommend you over hundreds of exclusive photo shoot locations found across Japan. Although every single location in Fujigoko area deserves this recognition, I would like to introduce you one of the most prime photography spots in the area known as Chureito Pagoda. 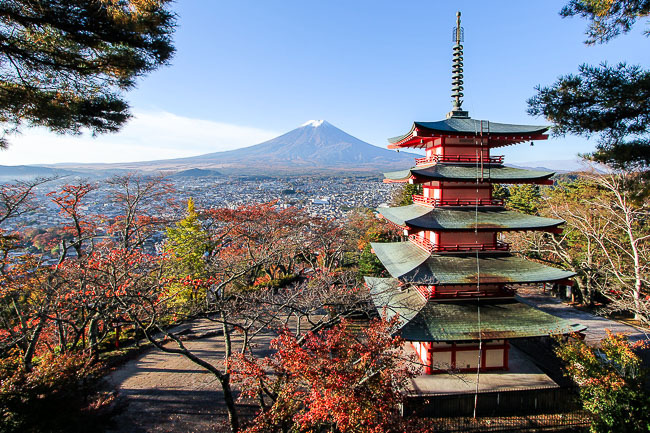 Located on the mountainside, this stunning five storied pagoda is a must-see place in the Arakurayama Sengen Park. There is a viewing platform from where anyone can capture the marvelous view of Mt. Fuji, together with Fujiyoshida City of Yamanashi Prefecture, cherry blossom in the spring and autumn leaves during the fall. Visitors are to ascend nearly 400 steps to reach the top of the mountain. That’s where the five-storied pagoda stands on! On the way up to the top, marvel at the torii gate and enjoy the views of the maple trees found along the stairs. Here, the second week of November is considered to be the best time to see fall colors. Visit the shrine grounds in the early morning to avoid the crowds and clouds. I know you don’t want to miss the view of Mt. Fuji, and if you are late, then clouds in the sky will resist you not to view the peak. I hope on the day you visit it, Mt. Fuji will not be covered by cloud. What a breathtaking autumn scenery of Lake Yamanakako! Photo Credit: Yuga Kurita at Flickr. One of the five lakes that surround the majestic Mt. Fuji is Lake Yamanakako. Being the less touristic area of Fujigoko, not many tourists actually pay a visit to this incredible site. Obviously they ignore exploring a gem that looks fabulous during autumn. Kawaguchiko is full of crowds and if you are searching for a site that is less crowded and tranquil at the same time, visit Lake Yamanakako. You can walk along the shore of Lake Yamanakako and be overwhelmed by the view of Mt. Fuji and surrounding fall foliage. Besides, bird watching here is quite enjoying as well. You will be thrilled seeing abundance of colorful leaves in the Yuyake no Nagisa Park. In fact, this is where the Yuuake no Nagisa, Fall Foliage Matsuri takes place. This year it will be held from October 26 to November 11, 2018. In the evening, deciduous trees of the park will be illuminated breathtakingly from 16:30 to 21:00. The photograph you see above has been captured by a professional landscape photographer – Yoga Kurita. You can see his excellent photography works at his personal website here. Traditional thatched roof houses and Mount Fuji in the background. Photo Credit: www.fujisan.ne.jp. Every visitor to Fujigoko aims to see Mount Fuji. That’s their first reason to visit the area, but they also want to explore its beautiful surroundings which include the museums, old villages, gardens, and impressive scenery created by four seasons of Japan. Iyashi no Sato, a Japanese traditional craft village and an open air museum is located on the western shores of Lake Saiko. These thatched roof houses remind me of Shirakawago’s old traditional houses. In comparison with Shirakawago, this site features only few houses and the area is not as big as Shirakawago village in Gifu Prefecture. In search of a spectacular view of Mt. Fuji, many tourists flock to this unique landmark. The role of each thatched house varies; some have been converted into craft shops, restaurants, and while others have been treated as galleries, and museums. Here, tourists do love spending their time for a great photo session wearing Kimono and samurai armor. If you have not made up your mind where to go yet as a day trip from Tokyo this autumn, then I would highly encourage you to visit either Hakone or Fuji Five Lakes. These two remarkable destinations have got everything you need to make your trip enjoyable and unforgettable. The above described places are said to be the best attractions in Fujigoko area. Often people attempt to go on a hike in the area to be astonished by the fall colors and view of iconic Mt. Fuji. Your trip would be great if you decide spending an overnight in a hotel located along the shore of Lake Kawaguchiko or near a hotel adjacent to Kawaguchiko station. Make your hotel reservation at Fuji scenic house 73, located next Kawaguchiko station. The location of the hotel is just perfect and makes your trip easy. Thank you very much.